In order to gain the most leads and rank higher in the search engine, all websites should be fully-equipped with SEO. Furthermore, adding a real estate blog to your SEO-enhanced site will help even more in rising in ranking. Whether you’re tech savvy or just starting out, you can always increase your knowledge when it comes to your real estate blog. Below are a few key points to help you get on your way to effective blog creation. Eye-catching and appealing blogs for real estate marketing is a sure-fire way to keep your viewer intrigued with what you have to offer. A well-manicured real estate blog requires professional thinking with just the right platform and design. WordPress, an easy-to-use platform, allows you to customize features such as graphics and headers that are simple for viewers to read and navigate through. WordPress also offers Elite and Professional platforms that offer much more than the traditional WordPress. Also, whatever website you choose should be SEO-friendly so you can easily rank higher in search engine results. SEO can be your best friend when used correctly. 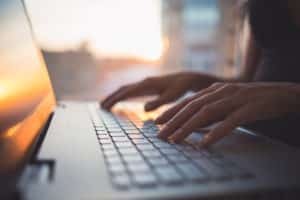 When creating a real estate blog using SEO tactics, the trick is to use relevant and authentic keywords throughout your text as organic and natural-sounding as possible. For example, when talking about a local area, be sure to use words that pertain to the city or town. Implementing the proper usage of keywords makes a search-friendly website stand out and is more likely to draw leads and create a steady flow of traffic. It may be useful to research the appropriate keywords for your article before assuming to use just any word. Social media has become a beneficial way of bringing leads to your blogs for real estate marketing to assist with your SEO. A quick update to your Facebook and Twitter profiles offer your viewers a glimpse of what your real estate blog is offering and urge buyers to seek more options. Facebook Ad’s generate viewers to click on an eye-catching picture that grabs the attention of the reader. Offer your viewers a quick tip update and incentive when they share your status or like your webpage. When posting Ad’s, updating your social media page, or sending newsletters, always use keywords to link back to your website. In real estate marketing, the best way to put yourself on the map is to give your customers an easier way to reach you and linking a word back to your website is a great way to entice potential leads. Applying SEO to images in your real estate blog is another way to further enhance its effect to ranking. When you choose images or video to include on your real estate blog, be sure to link each keyword to another, appropriate page whether it be a page of listing with prices and services or blog post with relevant tips and information. Links and keywords go hand-in-hand when pushing you to the top in the search engine. For more information on real estate marketing, SEO services, appealing graphic design and much more, contact the tech-savvy members of For Sale Marketing will help you successfully achieve your goals with you real estate blog.